La Chata : Located on Corona between Cotilla and Juarez La Chata serves great Mexican food with prices on the high side of medium. La Playita : Located on Juarez near Corona, La Playita offers good Mexican food with prices that are very affordable. Great budget option for this part of town. La Rinconada : Located at 86 Morelos near Plaza Mariachi. The medium to high priced restaurant is set amid a Spanish colonial atmosphere and caters to upper class Mexicans as well as tourists. Known for delicious meat / fish entrees, and Mariachi music. La Trattoria : Nice medium priced Italian restaurant located at 3051 Av. Ninos Heroes in the Zona Minerva. Pierrot : A moderately priced French restaurant located at 2355 Calle Justo Sierra in the Zona Minerva. Restaurant La Gran China : Located at 590 Juarez (between Martinez and 8 Julio). A good place to find Cantonese dishes served at very reasonable prices. 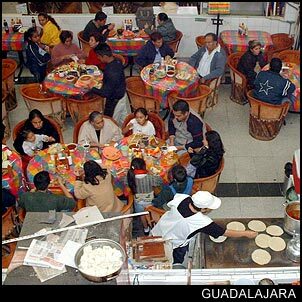 Restaurant Madrid : Located on Juarez between Corona and 16 de Septiembre. As the name implies, Spanish dishes are the order of the day. medium / reasonable prices are also a plus here. Sandy's : Located on the northeast corner of Colon and Moreno (second floor). Sandy's is a very nice moderately priced restaurant with great views by the open balcony windows which overlook the plaza below. They open at 8:00 AM, so they are a good place to eat breakfast too.